Undemanding in many ways, climbing plants can be the best answer to many garden and landscaping problems. If we look as some of the better choices you will see that they do not take up much space in the ground, yet can be large, cover a wide area such as a wall or fence and many add masses of color to otherwise dull spaces.. Some gardens are just made for climbers, lots of space above the ground and not much on it. Other gardens are just made for some of the more exotic climbers, the ones that are a 'little difficult' but are outstanding in form. So walls, fences, pergolas, obelisks or simply other plants can all act as supports for climbing plants, depending on the species..
And in our cool climate many climbers can be treated as annual or perennial depending on what you require. The English garden has a history with climbers, ranging from shade loving types such as ivy, through to some of the best flowering types wisteria, clematis, passiflora, hardenbergia, climbing dicentra, lapageria the list goes on, and with so many available for sale by mail order climbing in the Uk, how do we decide if a climber is suitable for our garden? as a screen or cover for a fence or wall. to cloak an arbor and add atmosphere. to provide shade in the summer for an outdoor area, windows or shade loving plants. for the decorative nature of the flowers and foliage. The decision on what to plants depends on the purpose and the position. Wisteria and Jasmine are fairly vigorous growers and need space, and a structure to grow on. Wisteria may look fantastic in images of Monet's garden at Giverny however it can also get into the eves and gutters of a house if you fail to maintain and prune it, maybe its better to grow it on an arbor or other structure if garden maintenance is not your strong point. Jasmine is a great fragrant climber, but can smother other plants if let go, it can take over a tree if you are not careful. You may need to consider these when planting vigorous climbing plants. Many deciduous types such as Clematis and Mandevilla can be allowed to grow through smaller trees and shrubs; with their beautiful flowers and more open growing nature they will not smother plants as readily as others. Mandevilla and Clematis can even be grown in pots or containers as long as the pots (and therefore t he root system) are kept cool and shaded. Try growing one of the new hybrid clematis through an obelisk or tripod. Lapageria Rosea is our number one climbing plant, not always easy to grow needing a cool moist acid soil. All Lapageria need protection from direct sun so a shady position is essential, frost is a killer, but we love them. Wisteria are fast growing climbing plants, requiring a fair amount of maintenance, and you need to prune them to encourage flowering, but what flowers! A wisteria in full flower will indeed take you to Monet's garden at Giverny, and who would not like to go there. Hybrid Clematis. Clematis are a beautiful climbing plant, fantastic flowers, beautiful range of colors, easy to maintain and they don't take over the garden. 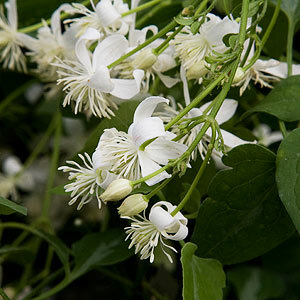 Hybrid clematis do not need a lot of space; simply a cool root run beneath and some sun above. The humble potato vine, it is evergreen and flowers well, Solanum gasminoides, its tough, it does need support but is very useful.